The article considers the problem of improving the competitiveness of modern graduates through developing critical thinking. The personal characteristics of modern graduates are analyzed in the light of humanization and humanitarization of higher education. 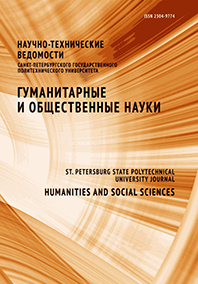 Based on analysis of opinions formulated by foreign and Russian experts, it is suggested that modern graduates should possess professional skills as well as various personal characteristics demanded by employers, such as the ability to work in a team, leadership skills, flexibility, communication skills, and effective decision-making. The article is aimed at explaining the concept of “critical thinking”, which includes acmeological and reflexive components important for developing the graduates’ personal characteristics. We have described the conditions for successful development of critical thinking skills in the educational process of the university. It is shown that humanities courses, including foreign language studies, contain a lot of philosophical issues that need to be analyzed and discussed in detail. This means that such disciplines are aimed at developing communication, debating, decision-making skills, as well as active listening. Various excerpts from fiction used in foreign language courses give examples of controversial life situations in which certain social skills, personal qualities, decisions and actions are demonstrated. Students learn to think critically in order to be able to interpret these situations correctly. Developing critical thinking in foreign language courses is used as an attempt to develop students’ personal characteristics serving to improve their competitiveness.